Transparency in The Extractives Industry: A role for Tech? 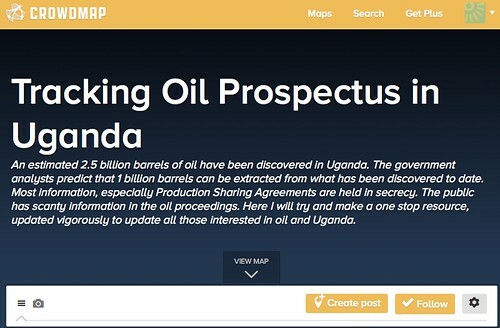 On a single day in March last year, three countries — Tanzania, Kenya and Mozambique announced discoveries of oil and gas (joining Uganda as possible oil and gas producers.) This was momentous, and according to this article in The East African, there are several major infrastructure projects in the East African region that are unprecedented. With all these projects in the region the question of transparency and engagement with citizens affected comes up. The Africa Progress Panel led by Kofi Annan has estimated that the DRC has lost around $1.3 billion as a result, almost twice its annual health and education budget combined. With the recent discoveries of oil, gas and minerals in the East African region do we want that statement (and that incredible ration 19-to-1!) to be true in the coming years, or what can be done differently to ensure that there is transparency that leads to accountability in the extractives sector? i would still argue, moreover, that if outsiders want to promote prosperity, or get out of a bad equilibria, far better to talk about term limits and strengthening political parties and parliaments. People in poor countries hate corruption too, and will eventually take care of it if they have the means to mobilize and exercise voice, and hold leaders accountable. Outsiders can’t do much about that, but if they speak loudly and consistently on the subject I think they strengthen the people’s hand. The question I have, is what can the technology community do? The means to mobilize and exercise voice are freely available to us with tools like Ushahidi, SMSsync, FrontlineSMS and others. Can platforms be used to report corruption close to the location of where it occurs? Are there secure ways BRCK + VPN = A secure blackbox for reporting corruption? Create a feedback loop with affected community e.g Turkana people in Northern Kenya reporting via SMS about how their community is affected (positively/negatively) I am reminded of the recent announcement by Refugees United, working with Safaricom to launch a helpline for refugees to find lost family. Could a helpline for affected community in mining areas be a way to not only provide a channel for participation, mobilize and give voice to the concerns of citizens? There is a great series on our blog about Anti-Corruption and transparency mapping: What can we learn and implement in our various countries? Recent news about the signing of The Open Data Charter point to another avenue for action. What sorts of data sets should be available to help shed light on the extractives industry. Which companies are transparent about the agreements they have put in place with governments, counties, and community? If positive action is being made, are we applauding those companies and shaming the ones engaging in corrupt practices? Lets have a look at Kenya (Home of Ushahidi, Mpesa, BRCK and Kenyan transparency Champion John Githongo). There are several local organizations working on issues in the extractives industry. Not necessarily the technology bit, but the gamut of concerns.Below are are a few resources, though it appears that there is more to learn and certainly more to do in this regard. If you have more resources and links, please do share in the comments and if you’d like to partner with us, do let us know how we can be of assistance to help answer the above questions. 2. Institute for Human Rights and Business – This appears to be trying to influence the decision makers at the UN level. Would be good to know more about how human rights violations are reported and if there is a role for tech and dynamic data collection to feed into the reports. 3. 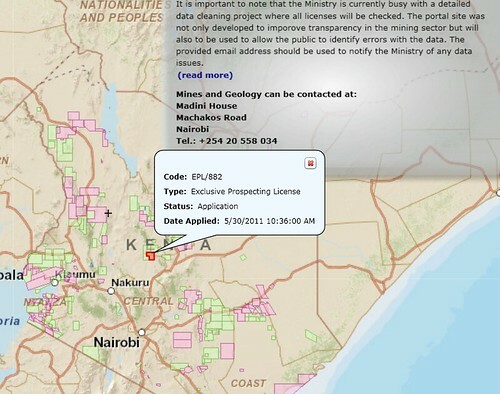 Kenya Mining Licences Map! This is great. Certainly applauding the work of Majala and Kenya’s Ministry of Mining for putting this together. Check it out, dig into the data. Many thanks to Charles Wanguhu of AfriCog, Majala Mlagui of Thamani Gems and John Githongo for the inspiration.